If you're making the trip to Duluth to follow the Denver hockey team as they get set to play Minnesota-Duluth this weekend, there is no shortage of great things to see and do. You can kill two birds with one stone - literally and figuratively. 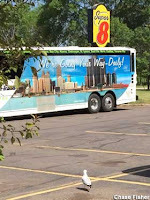 Book a room at The Super Eight Motel, 4100 West Superior Street, Duluth for your accommodations. 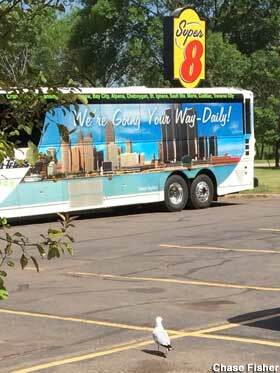 For the past 14 years, Steven Seagull, a seagull, shows up several times a day and knocks on the door for donuts. The persistent bird is not to be confused with Steven Segal who weighs 400 more pounds than the Seagull. Steven 'Seagull' was spotted several months ago so you could expect to see him on your visit. 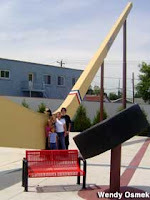 True hockey fans can take a brief 1-hour trip to Eveleth, MN to the (formerly) world's largest hockey stick at 21 meters. It weighs over five tons and is 110 feet long. It is displayed as if it's about to slap the world's largest hockey puck, which weighs 700 pounds. Eveleth holds firm to their claim but there is a larger hockey stick monument in Vancouver Island, Canada. On July 14, 2008 the record keepers at Guinness officially bestowed the title of "world’s largest" hockey stick at 63 meters long, weighing 33 tons that once graced the entrance to Expo 86 in Vancouver. Still, the Minnesotans hold firm with the argument that it is not the size of the stick that matters - it's how you use it. You be the judge. Frigid describes more than just the coeds at Minnesota - Duluth. During the winter, Duluth is second only to International Falls (“The Icebox of the Nation”), Minnesota in terms of rank among the nation’s coldest cities according to The Farmers Almanac. In January (the coldest month), it’s only 16°F on average. An example of how extreme the cold can get there can be seen during the “The Great Cold Snap of 1996” (January 29 through February 5). During that time, Duluth recorded 164 consecutive hours of below zero (°F) temperatures. On February 2, 1996, the low temperature was minus 39°F and the high temperature was minus 21°F. Duluth receives nearly 80 inches of snow, much of it as a result of cold easterly winds flowing over the western tip of Lake Superior, producing local lake-effect snowfalls. The Pioneers have planned a perfect time to visit - early November. I'm a relatively recent grad - I'll be at the game, front row on the boards. Duluth really is a pretty cool down. Fitger's brewpub is worth a visit, and the walk along the lake is pretty cool for those of us who are normally landlocked.